Phil Solomon's monumental three-projector installation American Falls, commissioned by the Corcoran Gallery of Art in Washington D.C., is being presented at the Museum of the Moving Image through November 25, 2012. The large-scale work takes up the Museum's entire third-floor Changing Exhibitions Gallery. Film historian Tom Gunning wrote of the installation, in its current form at Moving Image, "truly a masterwork. No one should miss this." Phil Solomon will be present at the Museum on Wednesday, October 3, for an opening reception and a screening of selected films and video work. This article was written by Genevieve Yu for the premiere at the Corcoran in 2010. Until recently, Phil Solomon seemed to be one of the unlikeliest proponents of digital filmmaking. 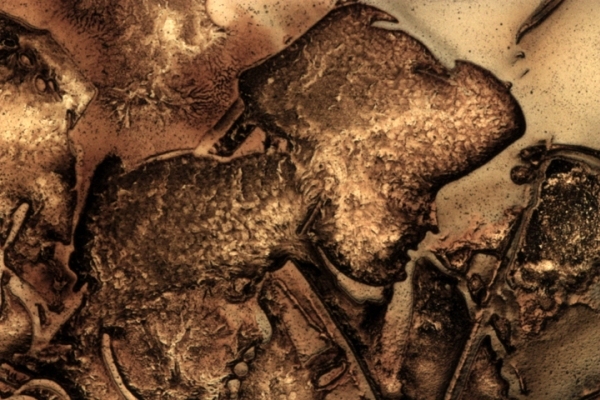 Profoundly influenced by his mentor and later collaborator, the legendary Stan Brakhage, Solomon has been chiefly concerned throughout his 30-year career with the physical properties of celluloid, which he boils, burns, and otherwise submits to closely guarded secrets of alchemical manipulation. Yet unlike those who have begrudgingly transitioned into the world of HD cameras and Final Cut Pro, most often for financial reasons, Solomon over the past decade has radically embraced the digital, taking as his object the vast video-game landscape of Grand Theft Auto for his In Memoriam, Mark LaPore series of films. This shift to "experimental machinima," or the use of a game's preexisting architecture to construct a film, was surprising to many, not because the work was by such an esteemed veteran but because the films themselves were so bracingly vital. Two current exhibitions in Washington, D.C., round out the scope of Solomon's career to date: the National Gallery of Art is running a retrospective series of his films and the Corcoran Gallery of Art has on view a site-specific commissioned installation, American Falls, which wraps around the museum's central rotunda. As these concurrent programs demonstrate, the line between film and art is becoming increasingly blurred as filmmakers like Martin Arnold and Apichatpong Weerasethakul move beyond the festival circuit or art-film theaters and onto the white walls of the gallery. 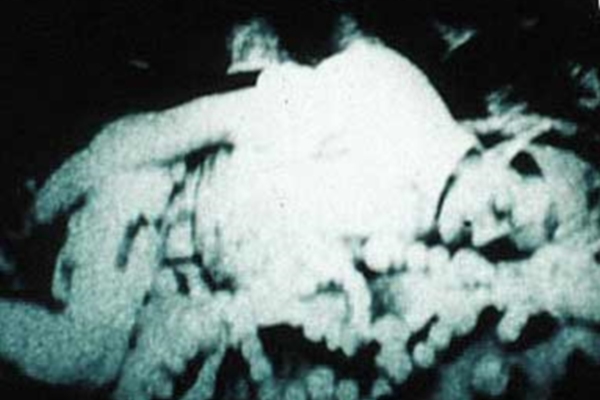 Though such boundary-crossing has occurred before—notable instances include Hans Richter and Viking Eggeling's artist films of the 1920s, the solid light installations of Paul Sharits and Anthony McCall in the 1960s and 1970s, the experimental classics of Andy Warhol and Michael Snow, and the enduring presence of video and installation art—Solomon's recent turn to the gallery is remarkable for happening long after his reputation as an experimental filmmaker had been firmly established. The avant-garde film community has remained notoriously isolated from contemporary art, though in recent years a number of practitioners, particularly younger filmmakers like Michael Robinson and Ben Russell, have, like Solomon, embraced new materials and exhibition spaces, suggesting that this hermetic world may be opening up. Solomon's own artistic concerns have opened up as well, moving from the intimate, small-scale explorations of his own life in his earlier work to grander cultural and historical subjects. The most recent work does not omit the personal, but weaves it through broader registers of collective memory and experience. The 2008 installation EMPIRE, for example, which forms the coda to In Memoriam, depicts the New York City skyline without the twin towers. In addition to being a profound experience of national grieving, this loss was also deeply personal for Solomon, as LaPore, the filmmaker friend to whom the series is dedicated, took his own life on September 11, 2005. American Falls is in many ways Solomon's most ambitious work, an immersive, six-channel installation that layers grand moments of promise and failure—the flight of Amelia Earhart, Tesla's experiments in electricity, the Second World War, the civil rights movement—but without compromising a sense of fragility and tenderness in the midst of its epic scope, the crashing sound and sweep of its waves. The National Gallery's film retrospective, organized in three programs, surveys Solomon's work in a loose chronology, from the cracked and crystalline realms of the childhood-themed films of the "Lullabies" section, to the evocations of mortality painted in the somber metallic hues of "Nocturnes." Along with an HD, single-channel version of American Falls, In Memoriam screened first in the "Elegies" group, a digital selection that offered a fitting introduction to Solomon's themes of longing and loss, as well as his interest in stretching the possibilities of his chosen medium, whatever it may be. With celluloid, Solomon is known for laboring over the making and unmaking of his images, hand-processing a combination of found materials and his own footage so they bleed into each other, often appearing abstract but with moments that are dimly recognizable. The scenes Solomon shoots himself remain unlocatable, generic snippets of home movie footage whose specificities are erased in favor of a faint sense of cultural memory, as with the image of a family wading in shallow water in The Snowman (1995), the close-up silhouette of a girl's hand in Clepsydra (1992), and the lightly quavering sight of a man lying in a hospital bed in The Exquisite Hour (1994). Whether these scenes came directly from Solomon's camera is hardly the point; in his magician's hands, all of them commingle in some vaguely familiar elsewhere. This is Solomon's gift, making first-person films and then making them ours; through this act of communion he reminds us of our own wide-eyed experiences of wonder before a cinema screen. In The Secret Garden (1988), the distressed subtitles of a cinematic version of Frances Hodgson Burnett's classic children's tale indicate how all film—here with icy colors flecked and flickering like fire—houses a space of secrets to be uncovered by the viewer. Solomon's films follow the associative logic of dreams, in which the images we encounter in everyday life are rearranged into totemic forms suggesting meanings just out of reach. Solomon works primarily with found or prerecorded footage, often using iconic figures from film history like the Golem in Psalm III: Night of the Meek (2002) or the bellowing wizard of Oz in The Secret Garden in combination with the textures of the mundane. The chemical distortions he enacts on these images, however, often render them indistinct and unrecognizable, save for the moments they emerge from their celluloid soup. For Solomon, process and decay are part of the cinematic image, which is intrinsically unstable and fleeting. As we frequently take for granted the transparency of the filmed image, these works, less recorded than wrought, demand that we examine their perishable nature by focusing our attention on what we can't see, or what isn't clear. 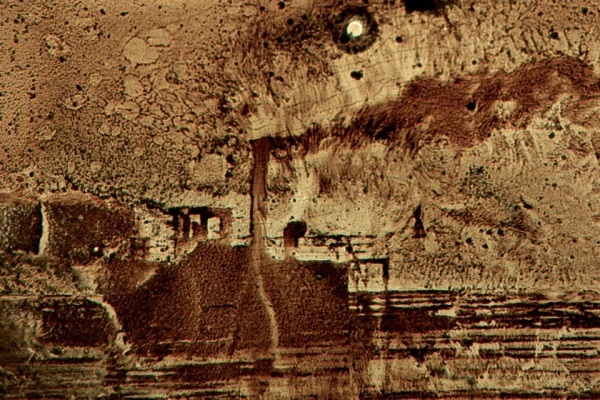 And as film is so often tied to a notion of history, both on a national scale and a personal level, these chemical operations demonstrate the extent to which all histories, all stories, are to some extent opaque and unknowable. With the video game as found object in In Memoriam, Solomon's practice takes an intriguing turn: no longer concerned with process in a physical sense, he's instead engaged in the free-roaming possibilities of the digital expanse. 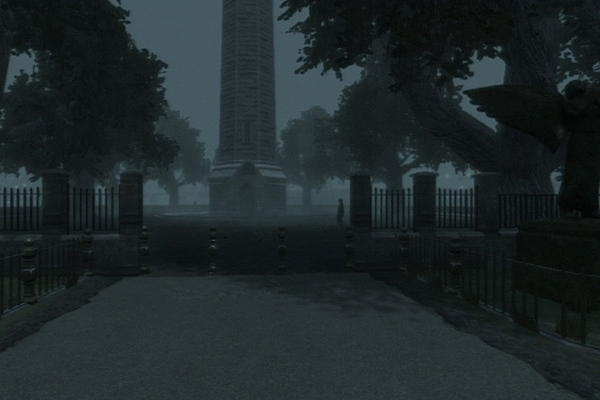 The first of the series, Crossroad (2005), was made with LaPore after an evening of play, two boyhood friends looking up "cheats" online to bypass Grand Theft Auto's rules and discovering their own surrealist adventures. After LaPore's death, Solomon went on to make three more films in honor of his fallen friend: Rehearsals for Retirement (2007), which, with its flying bicycles and sequences of treading water, makes vivid use of the physics-bending codes; Last Days in a Lonely Place (2007), a desolate, burned-out noir city shot in black and white; and Still Raining, Still Dreaming (2009), a study in the passage of light across the streets of a digitally rendered New York, made in the contemplative ethnographic style of LaPore. With each film, Solomon delights in the freedom the game gives him to move through and to shape space. As one who has suffered from illness, he noted in the Q&A to "Elegies": "I struggle with the limitations of my body." Released from the constraints of his own method of working through film, he finds in these machinima a liberating sense of play, and there he transposes his characteristic baroque lyricism to a perspective without a body, a gaze untethered. Yet In Memoriam remains entirely recognizable as a Solomon work: with echoes of Phil Ochs's melancholy lyrics or the deep shadows that creep over a Chinatown storefront, we find wisps of grief and longing in a landscape that might seem familiar, but is one we've never seen before. Like the bubbled metallurgic surface of Psalm II: Walking Distance (1999), American Falls is cast in shades of gold and umber, its images sometimes cracked and blistered like a hard-baked Death Valley floor, or violently bursting forth and pouring into each other like lava. The geological analogies aren't incidental: this view of the falls, or of "America's fallen," as Solomon puts it, presents the nation as if everything had been destroyed a long time ago, flooded over and buried, and finally excavated in its glorious ruin, its spotted molds. The chemical decay doesn't only express the distance of time; as it constantly evolves into new forms, it reminds us of the mutability of all images, how they're unfixed and ungraspable like the pictures that make up our memories. American Falls is staggering in size and scope, with its enormous HD projections and surround sound (the mix was composed by Wrick Wolff) arranged in a panorama around the Corcoran's rotunda. Over the course of a 55-minute loop, it catalogs devastating examples of tragedy that are, for Solomon, specifically American: the vertiginous rises and catastrophic plunges of Lincoln's presidency, oil speculation, the sinking of the Titanic, the Depression, the atomic bomb, wars, assassination, and broken promises. Unlike the footage used in Psalm II: Walking Distance, the scenes here are instantly recognizable, though noticeably distressed. The piece ends with the submerged voice of Marian Anderson singing "Deep River," marking the era of civil rights agitation and the cataclysmic end, felt by many including Solomon, that arrived with 1968. Yet one of the final images recalls a more contemporary moment: the lights from the twin towers blinking in the night sky behind the Statue of Liberty. Conceived in 1999 and realized over the course of the following decade, American Falls may reflect a different era of national history than the one it directly depicts, from the darkened eve of the Bush presidency to the inauguration of Obama, whose White House stands only two blocks from the Corcoran. Unlike the indictment that Ken Jacobs's Star Spangled To Death makes of 20th-century American popular culture and politics, American Falls ends on a note of tenuous brightness, a glimmer of the hope that was seemingly extinguished 40 years ago. What saves American Falls from overt didacticism is its curious blend of archival footage and well-known movie clips: Harold Lloyd hanging from a clock in Safety Last, the hypnotic swirls of Edison's Serpentine Dance, King Kong's last stand atop the Empire State Building, and the solemn soldiers returning home in Busby Berkeley's "Remember My Forgotten Man." In a nod to the Eadweard Muybridge exhibition in the Corcoran's adjacent gallery, the installation animates a number of the proto-cinematic pioneer's studies in motion, underscoring the work's indebtedness to the medium as a whole. For as much as American Falls is about America, it is also about cinema. This is its most compelling argument: that the image of America is inextricably tied to its films, and that America, moreover, exists predominantly on or through film, as much something documented in hard fact as constructed through fiction and fantasy. Some of the earliest films shot in the United States were of Niagara Falls, and with this piece, Solomon renews the connection between nation and image, history and film. American Falls was inspired by Frederic Edwin Church's Niagara (1857), one of the Corcoran's most treasured landscape paintings. From Church's perspective, the painter seems to be hovering right over the falls, surveying the distant farmhouses on the calm riverbanks above while describing the turbulent waters below. It captures something like a photographic instant, rainbow prisms suddenly appearing in the mists surrounding the falls. Like Niagara, American Falls is a work of stunning imagination and detail. It's also an enveloping view that sees far and wide, to the edge and the end of disaster, an elegy for the fallen but also a celebration of those who, like Anne Edson Taylor, the turn of the century's "Queen of the Mist," braved the plunge and survived.